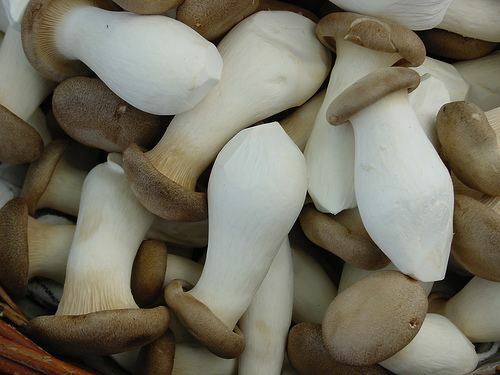 Pleurotus eryngii (also known as king trumpet mushroom, French horn mushroom, king oyster mushroom, king brown mushroom, boletus of the steppes, trumpet royale, Ali'i Oyster) is an edible mushroom native to Mediterranean regions of Europe, the Middle East, and North Africa, but also grown in many parts of Asia. 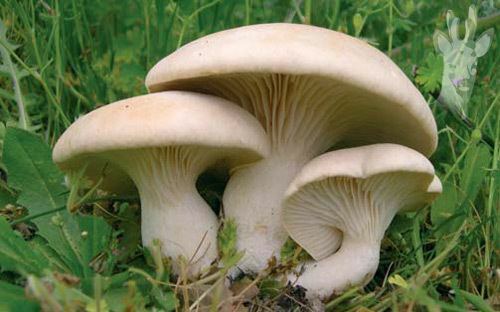 P. eryngii is the largest species in the oyster mushroom genus, Pleurotus, which also contains the oyster mushroom Pleurotus ostreatus. 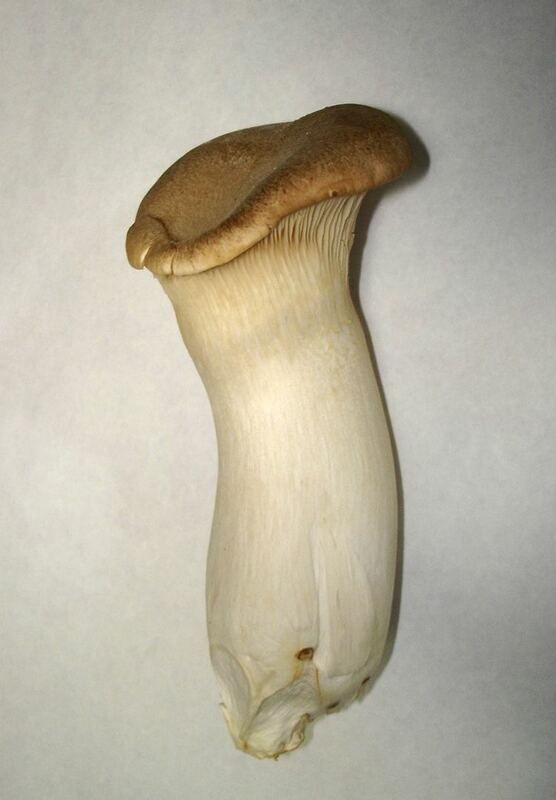 It has a thick, meaty white stem and a small tan cap (in young specimens). Its natural range extends from the Atlantic Ocean through the Mediterranean Basin and Central Europe into Western Asia and India. Unlike other species of Pleurotus, which are wood-decay fungi, the P. eryngii complex are weak parasites on the roots of herbaceous plants, although they may also be cultured on organic wastes. Its species name is derived from the fact that it grows in association with the roots of Eryngium campestre or other Eryngium plants (English names: 'Sea Holly' or 'Eryngo'). P. eryngii is a species complex, and a number of varieties have been described, with differing plant associates in the carrot family (Apiaceae). P. eryngii var. eryngii (DC.) Quél 1872 – associated with Eryngium ssp. Other specimens of P. eryngii have been reported in association with plants in the genera Ferulago, Cachrys, Laserpitium, and Diplotaenia. Molecular studies have shown Pleurotus nebrodensis to be closely related to, but distinct from, P. eryngii. Pleurotus fossulatus may be another closely related species. The mushroom has a good shelf life. An effective cultivation method was introduced to Japan around 1993 and has become popular there in a variety of dishes, and is now cultivated and sold commercially in Australia. Imported product is also commercially available in Australia and South Africa. It is also cultivated in United Kingdom, Taiwan, China, South Korea, Italy, and the United States. It has little flavor or aroma when raw. 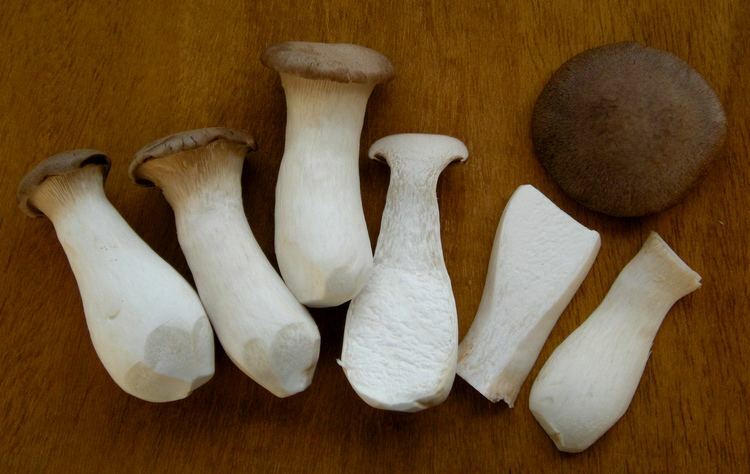 When cooked, it develops typical mushroom umami flavors with a texture similar to that of abalone. 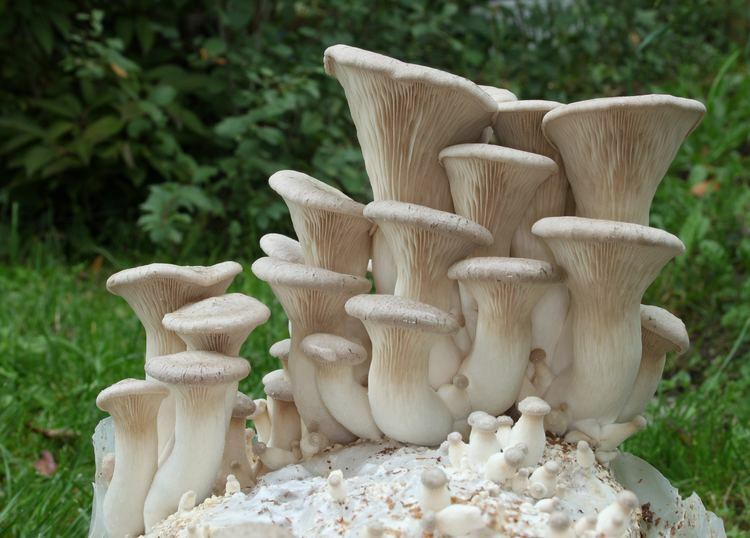 Pleurotus eryngii may contain chemicals that stimulate the immune system. 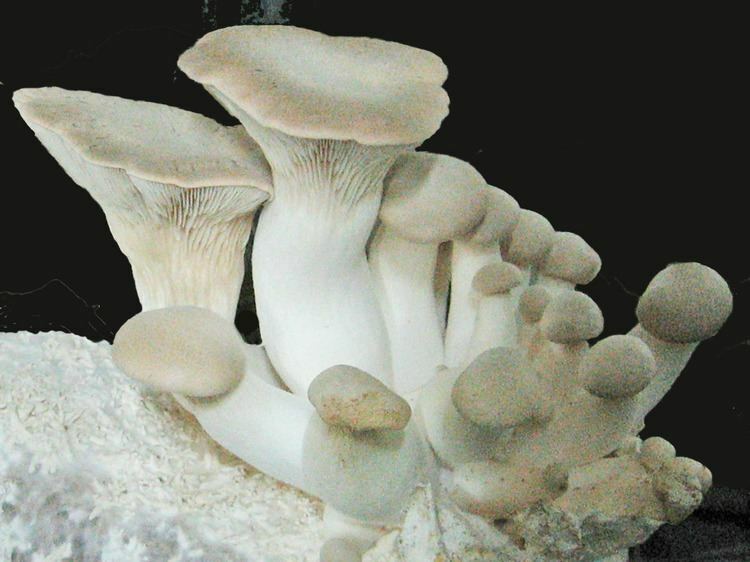 Dietary intake of Pleurotus eryngii may function as cholesterol lowering dietary agent. Like some other Pleurotus species, P. eryngii attacks nematodes and may provide a control method for these parasites when they infect cats and dogs.